We headed to the garden this morning to work on Plot 55 (Yes! THE Plot 55!). Dan continued to work on the bamboo and stick fence, while I worked a small area and set up a trellis for peas. The girls visited the other gardeners there, offering to help them dig up their plots, and checked in with us once in a while, to "redistribute" grubs or lend a hand in the planting of the seeds. Here is our plot - it's about 14 by 18 feet, which is soooo much larger than we thought it was before beginning our first planting last year. We wasted a lot of space, didn't plan well, and were absent for all of May and August, so...it was a disappointing experience. This year I can't say that we have planned any better, but we are going about it a little differently and are determined to stay around for those crucial gardening months. Here is a bit of the laying-out work we did today (gee, this looks so much more interesting to me than I think it must to you!!! Oh well, it's our way of journaling our baby steps, so just skip this part if you want!). Despite today's beautiful weather, the girls are still pretty tired, so we are out in short spurts (hack hack). In the meanwhile, there are so many books that we're enjoying right now, I thought I'd share some of them. This book is so beautifully done, and we have read it over and over. It has a lovely companion book, by the same author-illustrator team, called An Egg is Quiet that is also perfect for this time of year. The girls have been cracking up over Leaving the Nest, by Mordicai Gerstein, and Anika is carrying around the library's tiny copies of the Beatrix Potter books - I think she loves the combination of little and animals. I will expand this list in the sidebar; though trying to keep up with Dan's turnover is daunting, I will endeavor to change our reading list at least seasonally! Friday morning the girls hopped up from breakfast to get out a numbers BINGO game we've had for a couple of years. Little did they know that I'd stayed up late the night before (you know how these things go) and made a word BINGO to play with them. It was so simple - I got the idea for the kinds of words to use from Peggy Kaye's Games for Reading and then expanded with a couple of cards filled with words I knew would get the girls excited: nature words and...Harry Potter. And finally a little bit of Out. Not much, mind you. But the sun was beckoning and we so needed a change of scenery to change our grumpy moods. "Eliza I love you I am sore that you r sick"
A very wet walk in the rain after dinner for me, stories, bed...and now a quiet evening, hopeful for some solid sleep for the babes. A gifted woman named Patty made me a gourmet breakfast every morning. 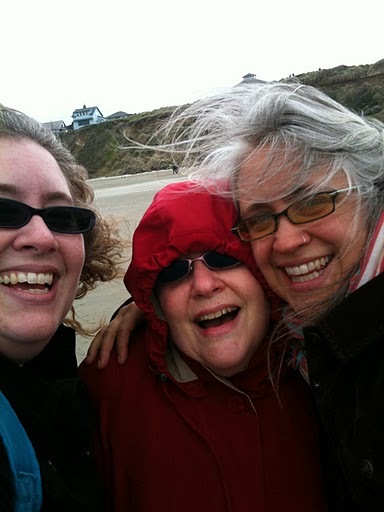 We visited the Pacific Ocean. Twice. I visited with people I love dearly. I breathed in the northwest in its lush swell of springtime. 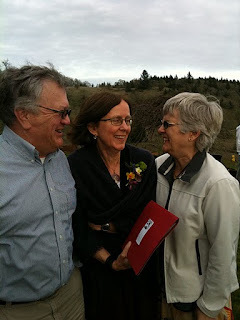 I shared in the joy and sweetness of a wedding, reveling in family, connection, the good stuff of Life. And as if that weren't enough, this dear woman drove an hour in the night to meet me during my layover in San Francisco. How's that for love? *photo of my mom, sister and I and photo of my aunts and uncle were taken by my sister - thank you!! After a morning of Quiddler and breakfast with Ani - always terribly entertaining - I told the girls that I wanted to do something with them to celebrate spring and the approaching equinox. I am traveling west tomorrow and will be gone over the weekend and so will miss the actual day, and it is one that gets us all pretty giddy. From the mud to the newness in the air, what is there not to love about spring? We headed out to the backyard where we sat with our backs warmed by the sun and read a few books about seeds and nests...and then we got to work. I loved this idea from the beautiful Magic Onions. We decided to refill our bird feeders and fill the stick house and neighboring trees with tufts of colorful wool roving for the birds to scavenge for their nests. 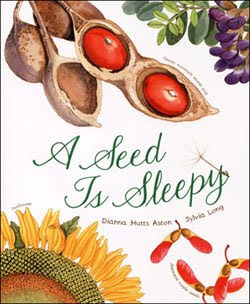 I could tell the girls felt like the very Root Children (we've been reading this version), making the spring more beautiful for little creatures. Blue skies were back today, so off we went...to sweeten the deal of having to run errands on the other side of town (Eliza is really aware of trying not to use the car every day, exploring the places we can walk to), we headed first to a trail on the ridge above all the places we had to go, picnic in tow. I was in search of violets (didn't see any) and woodpecker holes (saw lots). E wanted to see some spiders - she saw two and many of these beautiful jeweled webs. Ani had a list too long to begin mentioning...I think it was a little bit of everything. Dandelions!! They are so delicious this tiny - not bitter at all.